High Springs, Florida — The Police Benevolent Association was made aware of new allegations directed at Chief Steve Holley in a press release issued by the High Springs City Manger this morning. It appears that the City has opened an internal investigation into allegations against Chief Holley with regard to conduct associated with the performance of his duties as Chief of Police. The nature of internal investigations into allegations of misconduct is such that preclude public comment, specific to these issues, in an effort to preserve the elements of what should be an unbiased investigation. To that end, the PBA will reserve any comment specific to these allegations until the conclusion of the investigation and the release of its findings are made public pursuant to Florida Statute. Allegations are just that, and should be treated with unbiased scrutiny until such time as corroborating or exculpatory evidence is uncovered. We would urge the public and the media not to pass judgment regarding these allegations until such time as the investigation is completed and its findings released. Law enforcement officers dedicate their lives to the preservation of the rights and due processes afforded to all citizens through the Constitution and state laws. They themselves are also entitled to those same protections. Additionally, I can also confirm that this morning I personally received a letter, dated March 21, 2014, from the High Springs City Attorney which read, in part, “…This letter is written to you to demand that you immediately cease and desist any further public statements regarding the activities of the City of High Springs, City Manager Ed Booth and City Attorney S. Scott Walker, Esq.”. Additionally, the letter claimed that my previous press release statements regarding the termination of Chief Steve Holley were “an attempt to disparage or otherwise defame [Mr. Walker], this office, and the City Manager.”, and was signed “Govern yourself accordingly”. Given the threatening tone and content of the aforementioned letter, I personally find the timing of the City’s most recent press release suspect at best. 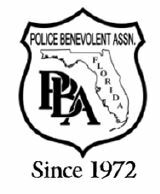 Florida Police Benevolent Association, Inc.